With the growth of asset-related data available through the Industrial Internet of Things (IIoT) and the complexity that comes with sifting through that data, organizations are faced with new operational challenges and opportunities for improvements. Chief among the challenges is the management of asset maintenance as industrial organizations typically manage hundreds of thousands of assets. Implementing efficient maintenance prioritization and effective work process management across multiple sites presents a major hurdle. The technology and know-how is available today to help drive profitability across all industrial assets. Success in this area requires that companies break from traditional perspectives and create a cooperative and collaborative environment, underpinned by the appropriate measures of performance and enabled by real time technology. 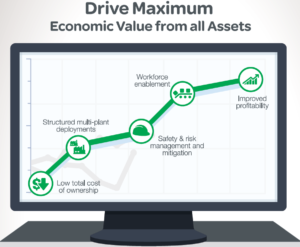 Enterprises seeking a means to leverage the IIoT for enhanced asset performance should evaluate their current Enterprise Asset Management (EAM) solution. The influx of data means that a simple EAM solution that automates basic maintenance tasks, while necessary, is no longer sufficient. The new breed of EAM is extensible, allowing organizations to tailor their solution to specific business needs. Configurable EAM solutions allow companies to design user experiences for particular roles. This means the solution can serve the needs of employees across the decision-making chain, from the plant floor to the executive suite. Remote and mobile access capabilities are also critical. With these capabilities employees are empowered to make timely and informed decisions, no matter where they are. Organizations evaluating their Enterprise Asset Management needs should be sure to consider this and choose a reliable vendor with a track record of success. Schneider Electric’s Avantis.PRO is a comprehensive EAM solution for the IIoT age and a key component of our Enterprise APM platform. Avantis.PRO provides the basics of maintenance management, MRO inventory management and complete procurement capability for asset intensive industries. In addition, our solution is fully extensible and configurable with remote and mobile access capabilities, allowing you to optimally leverage the IIoT to enhance asset performance. With 35 years of experience globally, our proven deployment method has repeatedly demonstrated the ability to drive optimal collaboration of people, processes and equipment across the enterprise. Every decision you make is dependent on the quality of information available to you. While most EAM offerings are capable of capturing vast amounts of data, users often find it difficult to access and interpret this data. Schneider Electric’s Avantis.PRO EAM suite provides the customer experience to make informed business decisions and manage all of your assets with confidence. Our industry standard architecture transforms data into information you can use in real time, quickly and easily, providing true asset intelligence. To learn more check out an on-demand webinar hosted by PennEnergy focusing on how Associated Electric Cooperative Inc. increased asset reliability. In this webinar you will see how Avantis.PRO has enabled AECI to improve their Preventive Maintenance efficiency. You will also hear from Schneider Electric on how to maximize economic return on assets with a fully integrated and comprehensive Enterprise APM platform. For more information on Avantis.PRO Enterprise Asset Management suite and Schneider Electric’s comprehensive Enterprise APM solution, visit http://software.schneider-electric.com/eapm. The global Enterprise Asset Management market is expected to witness a steady growth, expanding at a CAGR of over 8% from 2016 to 2023.